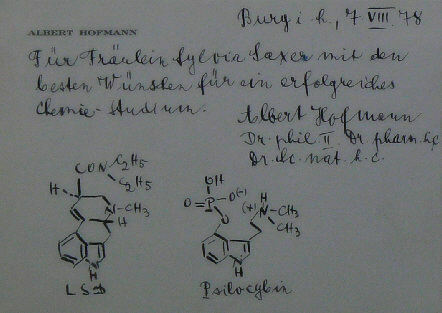 The chemist Albert Hofmann made his chemical studies between 1925 and 1929, afterwards he worked for the company Sandoz from 1931 till to his retirement in 1971. There he developed a hallucinogen by accident during experiments with the fungus ergot which later became famous as LSD. But for the time being he did not work with the detected substance. Only in 1943 Albert Hofmann produced LSD again, during this process he came in touch with this drug accidentally and it spread within his body. Thereupon he experienced a two-hour trip during which he had colored visions. This experience brought him to test the substance systematc in a self-experiment and recorded his research currently. This drug was designed for treatments of mental ill people and LSD was also used in this environment for the time being successfully. But finally the drug found its way to the public and was celebrated by the hippie and flower power movement in the 60s. The prevailing attitude of life at that time was not insubstantial influenced by LSD and its myth. Especially the icon Timothy Leary propagated the mass consumption of LSD, a statement which was criticed heavily by Albert Hofmann. The CIA also made some experiences which cumulated in a event of death. It didn't last long and LSD became demonized by the society and the politic and the medical use came to the end as well. Since then LSD is afflicted with a negative aspect against which Albert Hofmann fought most of his life, he also tried to legalize LSD and other psychedelic substances for researches. Only in 2007 the psychotherapist Peter Gasser got the permission by a Swiss ethics commission to use LSD tentatively for therapeutic purpose which was a kind of realisation of Albert Hofmann's lifetime dream. Beside LSD Albert Hofmann was also involved in other projects like psilocybin- and psilocin containing fungus or the Salvinorin of the Salvia divinorum. The synthesation of active ingredients of medicinal plants was the main activity of his researches. Albert Hofmann published several books, among others "LSD: My Problem Child". Albert Hofmann died in April 2008 at the old age of 102 years.